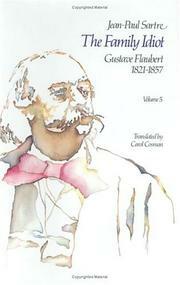 The second volume of an ongoing translation of Satire's dense, immense biography and analysis of the young Flaubert. Sartre's thesis, expressed in highly complex format, is that Flaubert was something of a child genius, and that by reading the works of his extreme youth, the lover of his later works can recognize all of the future masterpieces, such as Madame Bovary, in embryo. This contradicts the pre-Sartreian belief that Flaubert was a late developer, in fact, the "family idiot." When such a complex text is translated, it should be asked for whom the job of Englishing is done. Even in English, Satire's arguments are sufficiently difficult to follow as to discourage the casual reader. Moreover, the interested investigator into Flaubert's early work had better know French, as almost none of it has been translated. Therefore, we are left with a large project that may well be of use to a limited number of scholars or either Sartre or of Flaubert. Otherwise, this fairly expensive volume cannot be tailed a "fun read" for those who are less deeply involved on a professional level. This caution slated, il is important lo stress that Cosman has continued her fluent job of translating what is occasionally an unfluent original. Despite his awkwardnesses of style, Sartre's is certainly one of the most stimulating recent works on Flaubert, largely because nothing embarrasses the critic. Even Flaubert's likely episodes of homosexuality in adolescence and later are given their full due here, with a description of a comrade's appreciating "the feminine charm emanating from Gustave's young body." The details of the carnal life of the novelist are only a part of the exceptionally thorough and all-inclusive approach that the author takes toward his fascinating subject. Illuminating, but more for specialists than for the general reader.